Forget Millennial Pink, Ariel Okin examines the rise of hot new shade, "Gen Z Yellow," and tells you how to integrate the hue into your own home. Between the incessant stream of Glossier ads, chic natural beauty brand pop-ups, and targeted marketing galore, you can’t escape our dear old friend Millennial Pink. Which means it’s officially over. Farewell, pastel babe. We hardly knew ye. But don’t despair: a new color au courant has (depending on who you ask) already ascended/descended. Meet Gen Z Yellow: your new best friend and potentially the next star of Mansur Gavriel’s 2018 ad campaigns (at least that’s our guess). What apparently started as a culturally informed, highbrow movement has trickled into mainstream media. 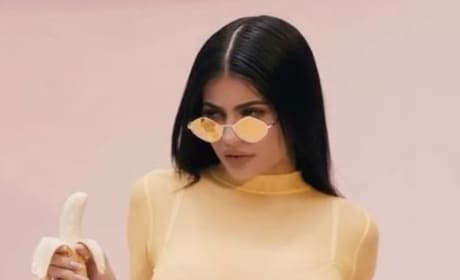 Even Kylie Jenner has made friends with the shade, as evidenced by a now-viral photo of her eating (what else?) a yellow banana, wearing a crop top in a matching shade. Brands like Fenty Beauty, snaps by Petra Collins, and features in Tavi Gevinson’s Rookie magazine are all starting to incorporate yellow-ish hues. See that’s the thing: Unlike its very distinct, big sister Millennial Pink, “Gen-Z Yellow,” as it’s now being called, doesn’t refer to one tone. It seems all hues on the spectrum are fair game, ranging from golden retriever to school bus to reflective crossing guard vest. Whatever hue you choose, here’s how to incorporate it into home without feeling like you’re trying too hard. But Which Yellow Should I Choose? Blending yellow with your abode’s current palette is a fine art. On the subdued side, pale yellows look beautiful with a muted color scheme: think cane-backed chairs, belgian linen fabrics in light washes, and an overall monochrome, tone-on-tone feel. For a bit of a funky pop, jewel tones, like a rich emerald green velvet, add both depth and sophistication to your space, creating a daring duo. On neon end of the spectrum, keep things stark and modern—think bright, cool white walls and and a monochromatic mood so pops of a true banana or neon shade can pack a punch. And while we never would tell you what not to do, we strongly recommend not painting all four walls neon yellow. Because, you know, eye health. Everything from enamelware to throw pillows seems to be popping up in pleasantly sunny shades. Lightly diffused and easily mixable, Gen Z yellow is a perfect hue to round out accessory items, adding a pop of trend while still keeping things timeless. If you want a refresh without going full fashion, accessories are the way to go. Feel free to experiment here with the more shocking range of shades; a pop of color from a neon vase or picture frame is a great way to add in some color to a space without having it feel overwhelming. Another easy, commitment-free option: layered rugs. Consider a neutral base, and swap out the smaller top rug depending on what shade or pattern is inspiring you at any given moment. In this case, overdyed Turkish rugs in the citron, mustard or pale wheat category look beautiful paired with rich saddle leather and worn wood for a collected look; a zingy bright yellow rug in a geometric pattern is a nice way to incorporate a whimsical, Memphis-style vibe. With so many shades on the spectrum, Gen Z Yellow is more flexible than her shade specific sister. Bedding is another relatively easy way to change thing as inspiration strikes. A light, pale buttery yellow duvet gives off a cozy, vintage feel, whereas crisp white hotel collection bedding with a hardy yellow stripe is a color statement in a more subtle way. What if I want more yellow? A delicious color for an inviting dining or living room, yellow is as versatile as it is welcoming. A few shades worth looking into? Tallow by Farrow & Ball, a flaxen wheat perfect for an entire room, which can skew both modern and traditional depending on the vibe you’re going for. Babouche, another F&B confection, is their version of a mustardy, zingy yellow (great for painting furniture in an accent color.) Benjamin Moore’s Showtime is another bright option for a statement wall or entryway—consider it in lacquer for full “wow” effect (pair it with a crushed velvet blush sofa and you just might break the internet.) For a more muted effect, Benjamin Moore’s Golden Straw is a subdued shade perfectly paired with an olive tree in a terra cotta pot and a natural woven rug for that coveted “who? me? trying?” vibe. Find the aesthetic that works for you, and don’t worry about messing up—with Gen Z Yellow (and maybe Gen Z in general) there are no rules. Click through the gallery below for more yellow-hued inspiration.